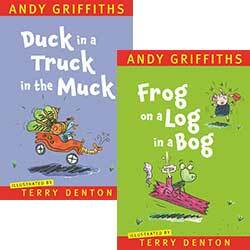 Andy Griffiths and Terry Denton: Just Doomed! It's been five long years since Just Shocking! was published. Is these the right books for you? Take the SHOCKING TEST and find out.
" Take one Shakespearean tragedy: Macbeth. Is this the right book for you? Take the crazy test and find out. Do you bounce so high on your bed that you hit your head on the ceiling? Is this the right book for you? Take the Disgusting test and find out. Do you do any - or all - of the following: pick your nose, talk in burps or wee in swimming pools? Really, really, really brave ... well, until the night. Schooling Around: #3 Mascot Madness! 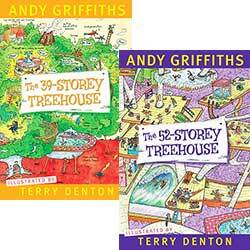 Andy Griffiths and Terry Denton: Just Shocking! Is this the right book for you? Take the shocking test and find out. Is this the right book for you? Take the stupid test and find out. Do you worry about getting sucked into the top of escalators? Big fat cows are EVERYWHERE!